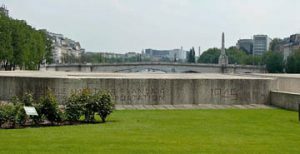 Straddling the eastern tip of Ile de la Cite just behind Notre Dame is the Memorial de la Deportation, a tribute to the more than 200,000 French men, women and children—including homosexuals—who died in Nazi extermination camps during World War II. 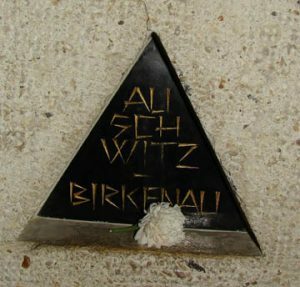 The memorial is a poignant reminder of the role racism, antisemitism, homophobia and flat-out hatred played in the deaths of nearly 50 million people worldwide during WW II. The free memorial is located on the actual site where many Parisians were processed and loaded onto ships for transportation to camps in Eastern Europe. For most, it was their final journey: Only 3% of French citizens sent to the death camps survived. 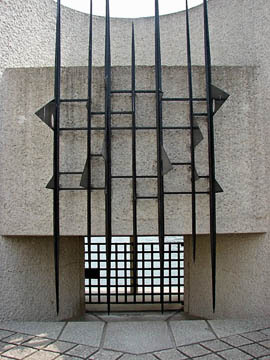 Created by French architect Georges-Henri Pingusson and inaugurated by French President Charles de Gaulle in 1962, the somber Deportation Memorial is designed to evoke a sense of imprisonment and claustrophobia—the same feelings experienced by those jailed by the Nazis—through its very narrow spaces and barred windows. Visitors enter single file down a steep, confining staircase to a small courtyard where barred windows look out over the Seine River and the freedom that lies beyond. 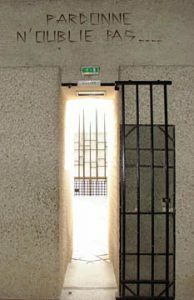 A tall, narrow doorway leads to a bleak concrete underground chamber holding the Flame of Eternal Hope and the Tomb of the Unknown Deportee that bears the inscription “They descended into the mouth of the earth and they did not return.” A passageway leading away from the flame is illuminated by 200,000 lighted crystals, each symbolizing a murdered French citizen. According to historians, of the 200,000 French men, women and children sent to concentration camps, 85,000 were French resistance fighters and 76,000 were Jews (including 11,000 Jewish children). It is unknown how many were gay, but historical documents show that 100,000 gay German citizens were arrested from 1933 to 1945. 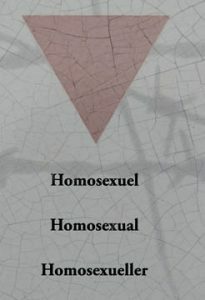 It is logical to assume that tens of thousands of other gay men and lesbians from all across Europe similarly were arrested and sent to Nazi camps during World War II for no reason other than their sexual orientation. Historians believe that of non-Jewish concentration camp prisoners, gay men had the highest rate of death. More than 60% of gay men imprisoned by the Nazis during World War II died, compared to 41% for political prisoners, who had the next highest death rate. There are markers scattered throughout Paris indicating the site of Nazi atrocities, including several plaques on school buildings noting the dates that the Nazi invaded the schools, seized Jewish children and sent them to extermination camps. But nothing is as powerful a reminder of what hate can do if left unchecked than Paris’s Deportation Memorial. If you’re visiting Notre Dame when in Paris (and, really, who doesn’t? ), take an extra half hour to tour the Deportation Memorial, located just behind the cathedral. You’ll be very glad that you did. Hours: Summer, daily 10 a.m.-noon and 2-7 p.m.; Winter, daily 10 a.m.-noon and 2-5 p.m. This entry was posted in History of Paris, Ile de la Cite, LGBT Paris, Sight-seeing and tagged Deportation Memorial. Notre Dame, Ile de la Cite, LGBT Paris, memorials, sight-seeing, World War II by Bob Adams. Bookmark the permalink.